I need to make a minor confession here … the reason it’s occasionally difficult to write the blog posts for my work is that they’re not always recent. Sometimes I’ve just finished them, but I started them months (or years) ago. Sometimes the pace of work and life has become so hectic that I’m writing these well after the work is done and published. Whatever the reason for the delay, it means that I have sometimes lost the urgency and meaning of the work. As one might guess, that obtains with the one I’m posting about today. And yet, there is a thing to be said. Recently, I’ve been reading again The Night Circus, by Erin Morgenstern. I find it both fascinating and mediocre. I find the way the plot plays out to be … unconvincing. As a piece of craft, however, I find it fascinating. In some ways, it reminds me of Lovecraft and his unspeakable horrors. The entire concept of the circus is one of mysteries perfectly executed in part by magic, and that blends with the entire concept of the book. And like the Lovecraftian horrors, one cannot cannot make them explicit without bringing them into a scope where our minds can put them into scale or comparison to other things. Yes, there is a lot of glowing semi-detail in the book, but it is all about limited physical details. That’s just a gloss. More importantly, there is no explicit building of the relationships between any of the characters (just hints and mysteries). It’s the opposite of “show, don’t tell” … “hint and tell, but don’t show”. All of which may be to say that I appreciate the author’s ability to pull off a novel’s worth of story in this mystique style, well enough that it was a best-selling novel. After all, it’s something I have so far only tried in miniature form or in poetry, and for me it takes a certain kind of thing where I hook my brain to the mystery of the universe and let words come out. I can’t imagine doing that for the length of a book and interweaving past and present and multiple points of view. Available on RedBubble fully colored and as an outline. 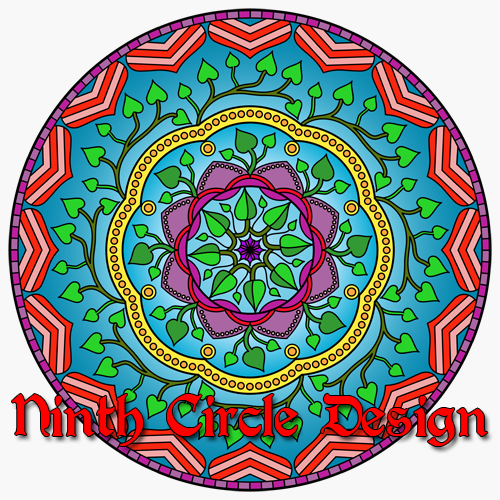 This entry was posted in I Made An Art and tagged books, i made an art, mandala, philosophy. Bookmark the permalink.